Huawei Consumer Business Group (CBG) has announced that their Light flagship, the HUAWEI Y9 2019, will be available for pre-order at selected retail shops from the 1st to the 8th of November 2018. In Ghana, the early bird customers who make a pre-order with a deposit of GHS 100, will get an amazing Gift Package valued at GHS500. The innovative high-tech phone caters today’s stylish generation follows the latest technology trend and brings upgraded CPU, front and rear dual AI camera, and the notched HUAWEI FullView Display to the entry-level models. The Huawei Y9 2019, comprises a notched 6.5-inch HUAWEI FullView Display with 3D curved design, offering consumers a wider, more comfortable and more fulfilling view. The screen is crystal clear with much narrower bezels, enabling the ultimate gaming vision. Users can experience cinematic-level visuals and smoother control. The phone also comes with a powerful battery of 4000mAh, providing 42 hours of call, or 7.6 hours of videos, or 10 hours of gaming, bringing users a longer enjoyment experience with long-lasting endurance. It supports an intensified AI Power 7.0 for comprehensive power-saving technology. Equipped with a quad camera and AI photography master, The HUAWEI Y9 2019 features a front dual camera with 16MP 2MP and a rear dual camera with 13MP 2MP. Users can create different effects with the AI 3D lighting such as soft lighting, stage lighting, butterfly lighting and split lighting, to name a few, all with the beautifying algorithm. These upgraded integrations allow consumers to take landscape pictures and produce studio-quality portraits and selfies in seconds, at a professional level regardless of where they are or the setting surrounding them. The device also comes with a Fingerprint 4.0 identification technology, to add to the list of the impressive features it includes. The Fingerprint 4.0 identification technology enables users to unlock the device in a remarkable speed of 0.3 seconds. This improved technology comprises fingerprint navigation, which helps users manage all the notifications with one key. Introducing a delicate design and unique modish new colors, HUAWEI Y9 2019 features a stylish look with a sleek silhouette and refined aesthetics. Its unique glossy appearance is timeless and youthful, and its latest technology trends offer users state of the art gaming, audio-visual and entertainment experiences. The Huawei Y9 2019 will be available in three color options — Midnight Black, Sapphire Blue and Aurora Purple and is expected to be launched in Ghana around 8thNovember 2018. To pre-order kindly visit any of the shops listed below. 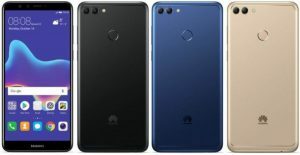 The post Huawei announces Pre-order for its new HUAWEI Y9 2019 appeared first on Citi Newsroom.